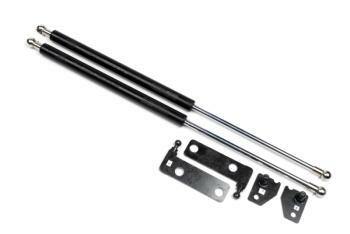 Password:JDM Hood Dampers looks great, works wonderfully, are offered by many companies, but not all of them are the same. Not trying to brag, but our hood dampers will beat out of anything offered by anyone else. What makes the PWJDM hood damper better than anything else out there, is that we’ve designed this damper especially for everything from a stock heavy metal hood, to a featherweight CF hood. How is this possible? With the PWJDM hood damper, you can adjust down the pressure within the damper itself! This is an industry first, and just goes to show Password’s continued commitment to this industry. We’ve integrated a pressure relief valve to reduce the excessive amount of charged gasses for applications such as CF hoods that don’t require the same amount of lifting force as a stock metal hood. What this means to you is that you won’t eventually overstress and crack your expensive CF hood. It always happens with other dampers offered by everyone else. The only solution to this problem the competition can offer is to con you into using only one damper instead of two. This is just outright stupid looking! If looking stupid is your thing, then by all means just keep on buying the junk offered by the competition. If you really care about both form and real life function, then PWJDM products should always be within your cross hairs. Painlessly easy to install you can’t go wrong with these PWJDM hood dampers. You have a choice of looking cool with satin finished black over stainless steel or show-polished stainless steel. You can’t go wrong with these! They are the single best investment you can make for your engine compartment! Besides, when you rock these dampers, you can finally get rid of that broomstick you keep in the corner of the garage (or your trunk).